Tucked away in three acres of private farm land in England’s Lancashire countryside, Brandreth Barn is just 1 mile from Burscough centre. The converted farm house Brandreth Barn is the ideal place for sightseeing, being just a short stroll away from the popular bird watching retreat of Martin Mere, and only a short car journey from the famous seaside resorts of Southport, Formby, Crosby, and Blackpool. Situated off the A59, Barndreth Barn is easy to find from junction 8 on the M61, junction 3 on the M58 and junction 27 on the M6. It is free to park at the Farm for visitors and Guests. 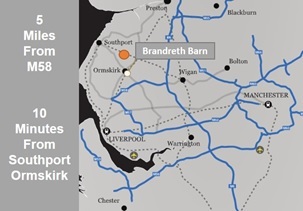 There are three railway stations in close proximity to Brandreth Barn: Burscough Bridge Interchange is approximately 2 miles, New Lane is approximately 0.8 miles and Burscough Junction is approximately 3 miles. Manchester Airport is just an hour drive from Brandreth Barn and Manchester Airport Train Station is on the Southport to Manchester train line, providing a direct route to New Lane Train Station, 0.8 miles from the Centre.